The examples in this series are based on an on-premises SharePoint Server deployment. 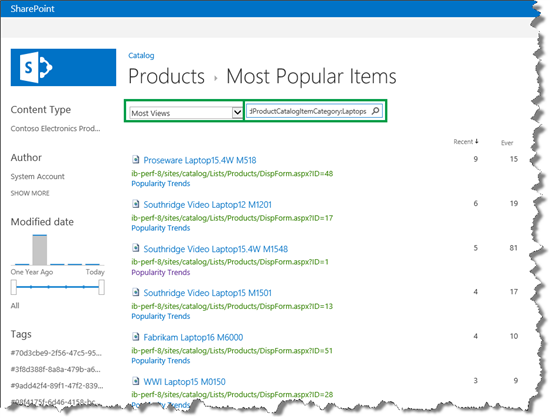 Most Popular Items shows usage event statistics for all items in a library or list. 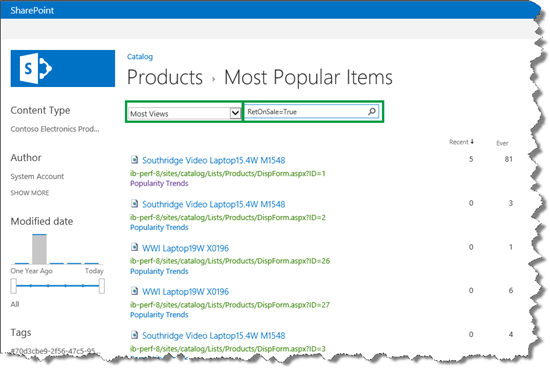 Popularity Trends shows usage event statistics for an item, a site or a site collection. The reports are automatically updated every 24 hours, when the Usage analytics job is run. On your authoring site, go to your catalog. Click the LIST tab -> Most Popular Items. On the Most Popular Items page, use the menu to select the usage event for which you want to view statistics. You can view statistics for the Recommendations Displays usage event in the View the Popularity Trends report for an item. On the Most Popular Items page, there are two time periods: Recent and Ever. On the server where SharePoint Server is installed, open the SharePoint 2013 Management Shell. `<EventTypeId>` is the numeric [View the usage event definitions](an-introduction-to-recommendations-and-popular-items.md#BKMK_ViewtheUsageEventDefinitions) of the usage event that you want to view. In the following example, we'll view the  *Views*  event. Therefore, we'll enter  *1*  . `<EventTypeId>` is the numeric [View the usage event definitions](an-introduction-to-recommendations-and-popular-items.md#BKMK_ViewtheUsageEventDefinitions) of the usage event that we want to change. `<TimeFrame>` is the new time period we want to set for the usage event. In the following example, to change the  *Views* **Recent** time to a week, enter  *1*  and  *7*  . Notice that the value for the RecentPopularityTimeframe parameter has changed to 7 . Viewing usage reports per usage event is useful when we want to see how visitors are interacting with our site. But many times we want to narrow the report to a specific attribute or category, for example all items that are on sale or all Laptops. To do this, we can use Keyword Query Language (KQL) If you don't know KQL, don't worry. You can easily narrow your Most Popular Items report without having much knowledge of the KQL syntax. In our Contoso catalog, we have a site column called RetOnSale . For each item, the value of RetOnSale specifies whether the item is on sale or not. To narrow the Most Popular Items report to only show items that are on sale, we'll use the managed property that represents the RetOnSale site column. In our Contoso scenario, this is RetOnSale (see How to find a managed property name). In the Search Schema, we can see that the RetOnSale managed property is Queryable . This means that we can use it to narrow the Most Popular Items report. To see Views usage event statistics for items that are on sale, on the Most Popular Items page, select Most Views, and enter RetOnSale=True . And just like that, only items that are on sale are shown. You can also narrow usage event statistics to a specific category, for example all Laptops . In our Contoso scenario, the Item Category site column is used to specify the category for each item. The managed property name of the Item Category column is owstaxIdProductCatalogItemCategory . The owstaxIdProductCatalogItemCategory managed property is queryable , which means that we can use it to narrow the Most Popular Items report. By narrowing the Views usage event statistics to a specific category, we can verify that the Popular Items Web Part is working correctly on our publishing site. 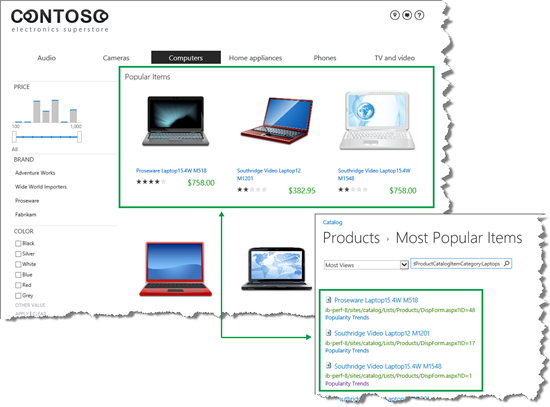 For example, on the Laptops page, notice that the three items that are displayed in the Popular Items Web Part are the same that are shown to have the most Views in the Most Popular Items report that we just narrowed to Laptops . 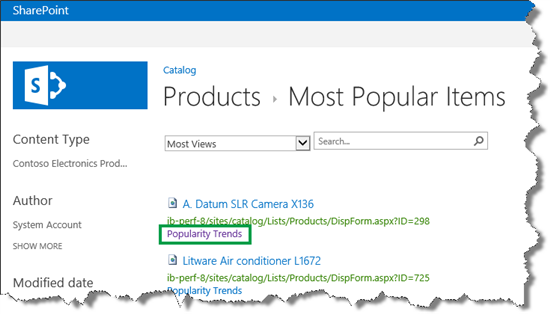 On your catalog, select the item for which want to view the Popularity Trends report. In the ribbon, click ITEMS --> Popularity Trends. On the Most Popular Items page, click Popularity Trends. Both of these options will open a Microsoft Excel sheet where you can view the daily and monthly statistics for the item. Each usage event is shown in a separate tab. 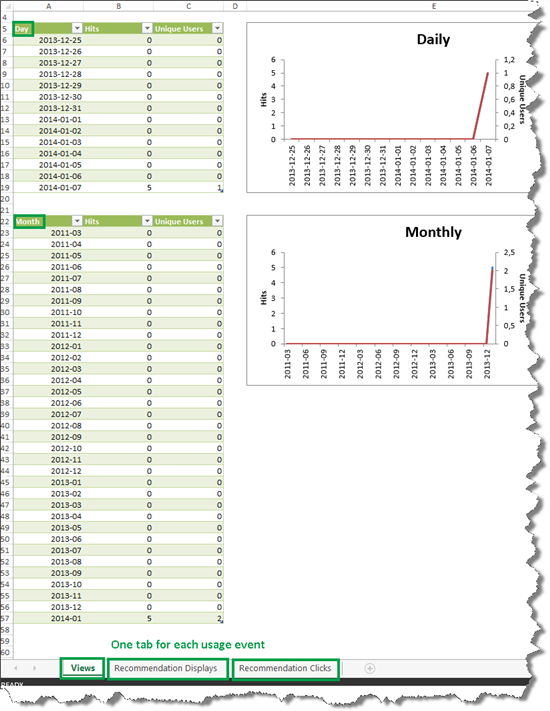 While we're on the subject of usage analytics reports, one usage event parameter that is worth mentioning is TailTrimming . This parameter specifies when the numbers that are shown in the usage analytics reports should be updated. This parameter does not affect how recommendations are calculated. For example, for the Views usage event the TailTrimming parameter is by default set to 3. This means that the usage analytics reports will be updated for an item when the item was viewed a minimum three times within the past 24 hours. For example, if the item Fabrikam Laptop16 M6000 was viewed two times within the past 24 hours, these two views won't be displayed in the usage analytics reports. If within the next 24 hours the Fabrikam Laptop16 M6000 item is viewed 4 times, the usage analytics report will be updated with 4 views. The reason the TailTrimming parameter is set to 3 is to avoid having to update items that almost none of your website visitors are interacting with. By not updating these items, you reduce the load on your system. On the other hand, when the TailTrimming parameter is set to 3, the usage analytics reports can be somewhat inaccurate. In the example with the Fabrikam Laptop16 M6000 , the two views in the first 24 hours won't be displayed up in the usage analytic reports. Total number of views of Fabrikam Laptop16 M6000 over the last 48 hours will show 4, but in reality, it was viewed 6 times. Where < `EventTypeId`> is the numeric [View the usage event definitions](an-introduction-to-recommendations-and-popular-items.md#BKMK_ViewtheUsageEventDefinitions) of the usage event that you want to change, and <  `TailTrimming`> is the minimum number of times the usage event has to occur within 24 hours for the usage analytics reports to be updated. In the following example, we wanted the usage analytics reports for the  *Views*  usage event to be updated if a  *Views*  usage event occurs within 24 hours. Therefore, we entered  *1*  and  *0*  . Notice that the value of the TailTrimming parameter has changed to 0. So with that, this series has come to an end. Hopefully you now have a better understanding of how recommendations and popular items work, and can start adding them to your website.